A CommonWealth Magazine investigation has found that many Taiwanese academics are publishing articles in dubious “predatory journals” in relatively high numbers. What is going on and how is it affecting the country’s academic community? Universities are considered the highest institutions of knowledge and erudition, but they have become prey for groups of people intent on exploiting them for profit, including in Taiwan. In a six-month investigation conducted with international media, CommonWealth Magazine scoured 22 journals suspected of being put out by predatory publishers and found that scholars from 114 colleges and universities and 15 hospitals in Taiwan had fallen into this generally unchecked international academic trap. In addition, Taiwanese academics have participated in suspected predatory conferences at one of the highest rates in the world relative to the size of its academic community. Are these unhealthy trends the result of a management loophole or of academics doing what they feel they have to do to survive? How have they affected academia in Taiwan and can they, in fact, be managed at all? Before CommonWealth asked him for an interview, Yang Tian-shiang, chairman of National Cheng Kung University’s Department of Mechanical Engineering, would not have connected his daily aggravation as an administrator to the “predatory publisher” issue being hotly debated in recent years in international academic circles. He would have been even less likely to think that one day the issue would affect his university. As department chairman, Yang receives more than 100 emails a day, of which 20 to 30 are invitations from conferences and editors of academic journals. “It’s gotten totally crazy now. Even [invitations] involving education or economics are sent to me. They just send them randomly, and they’re all in English. [Invitations for conferences] held in China are in English. I spend my time after I get up each morning deleting emails,” Yang says. Then there was one time when the best-known scholar in Yang’s field of expertise, thermofluid engineering, wrote an email to him inviting him to attend a conference. So used to getting rid of junk mails, Yang deleted it by mistake, and it was only when the scholar had somebody call Yang that they made contact. Refers to the frequency with which an article published in a specific journal is cited within a specific period; it is an important indicator in gauging the influence of a scholarly publication. Impact factors are released annually in the publication Journal Citation Reports. Yang had never attended this type of conference organized by a publisher, and it was only when he saw a video taken by one of CommonWealth’s international partners that he realized what such conferences were like for the first time. One sees different topics are bunched together in the same session and nobody asks questions. When the conference ends, professors panic when they have to answer questions from the media. “The video really shocked me,” Yang says. The term “predatory publishers,” or more precisely “predatory open-access publishing,” was first coined by University of Colorado librarian Jeffrey Beall, who believed that the behavior of these publishers in putting out journals and holding conferences for profit were preying on academic circles. Among the main characteristics of predatory journals are weak or non-existent peer reviews and even fake official websites. They solicit scholars to participate in meetings or publish, and tempt and deceive them by falsely claiming to be included in a well-known database or having a high impact factor. The emails Yang deletes every day may include such hidden temptations. He admitted that this was the first time he realized how serious the predatory publisher problem could be. Note: Attendance at conferences by doctors from university hospitals was added to the school’s numbers. A National Taiwan University Hospital doctor’s attendance was added to the total for NTU. This investigation represented the third time CommonWealth Magazine has worked in tandem with international media, and it originated with a global probe of the issue. In November 2017, Northern German Broadcasting, a member of the ARD association of public broadcasting corporations in Germany, issued an international report called “Fake Science Factory.” Since then, several media including Germany’s biggest daily the Suddeutsche Zeitung, Le Monde in France, the New Yorker in the United States, the Austrian Broadcasting Corporation and weekly magazine Falter in Austria, Norway’s biggest daily Aftenposten, Slovak Television, the Indian Express, and News Tapa in South Korea have worked together to investigate 22 suspected predatory publishers, sharing their findings on the platform of the International Consortium of Investigative Journalists. On Sept. 13, 2018, CommonWealth Magazine contacted Northern German Broadcasting investigative reporter Peter Hornung for the first time. “Next week, I’m going to Rome to take part in a WASET conference. There will be several Taiwanese academics participating,” read Hornung’s first email response. Those numbers seem bigger when considering the size of Taiwan’s academic sector. Taiwan has about 4,000 Ph.D. students graduate a year, roughly one-third the number in South Korea, but it had about the same number of academics as South Korea participate in OMICS conferences. Those countries ahead of Taiwan in the chart above all have substantially bigger populations than Taiwan. To further put the numbers into context, Joung Yuh-jzer, the director-general of the Science & Technology Policy Research and Information Center (STPI) under Taiwan’s National Applied Research Laboratories, suggests looking at a metric that Taiwan’s Ministry of Science and Technology sees as an important gauge of global academic activity – the share of global academic papers by Taiwanese scholars. That share is 1.57 percent, much lower than the roughly 1.92 percent of local academics who attended OMICS meetings, signaling the relatively high involvement of Taiwanese academics in predatory conferences. CommonWealth Magazine did another study, looking at the number of articles Taiwanese academia published in journals of the 22 suspected predatory publishers from 2010 to 2017. After downloading countless .pdf files and taking time to carefully verify them, we discovered 469 articles published under the above parameters that came from 114 Taiwanese colleges and universities and 15 Taiwanese hospitals. None of the journals had an impact factor, which academia uses to gauge the quality and importance of those publications. “That’s a big number. In Germany we only found 1,500 articles [from 2010 to 2017],” says Hornung. That may be three times as many as Taiwan had, but Germany also has seven times as many Ph.D. students graduate per year as Taiwan. The 469 articles found undoubtedly understates the real number. That’s because we relied only on articles with .pdf files to be able to verify their existence and because of the regional nature of predatory journals and conferences. Peng Tai-kuang, a professor with I-Shou University’s Department of Business Administration, cited the example of another suspected predatory publisher, the African Journal of Business Management. From 2007 to 2011, the journal published a total of 1,968 papers, of which 462 were from Taiwanese academics. Three years ago, this journal was discussed at the annual meeting of the Academy of Management and specifically singled out Taiwan as a problem. “I was there, and I felt completely ashamed,” Peng says. 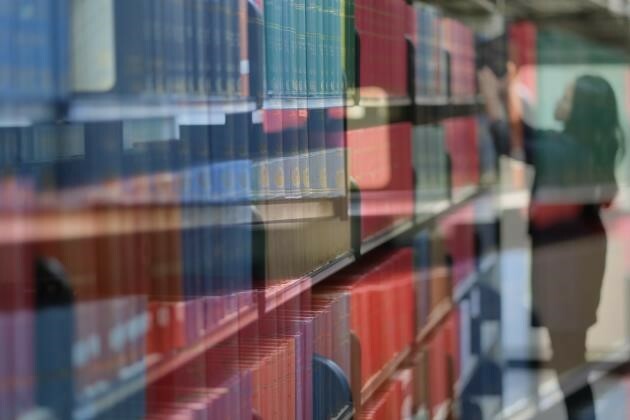 Lin Chi-shiou, the director of National Taiwan University’s Department of Library and Information Science who has studied the issue, was blunt in her assessment. How Did Predatory Publishers Come About? Unlike well-known, reputable journals, which are kept in databases, journals suspected of being predatory are generally open access. The open access movement emerged around 2000 to protest the soaring prices charged by the top five publishers of authoritative journals led by Elsevier, the world’s largest scientific publisher. The rules of the game in academia are such that copyrights for academic articles belong to the publisher once they get published, and authors are prohibited from publicly disseminating their work, other than passing their articles to friends. Publishers rely on subscriptions to their databases for income. Starting in the 1990s, these publishers began jacking up their subscription fees. “There was pretty much no way you could stop them from raising prices. You could only hope to keep them within a certain range,” says Ju Sheau-pyng, dean of National Taiwan University of Science and Technology’s Office of Research and Development. She previously was the deputy chief of Taiwan’s Science & Technology Policy Research and Information Center (STPI), which is responsible for negotiating prices for academic journals on behalf of Taiwan’s university libraries. From 1986 to 2003, spending on periodicals by American libraries rose 2.8 times, statistics show. The open access movement has been combating those price increases, and the latest salvo was fired in February 2019, when the University of California system boycotted Elsevier. It was by far the biggest U.S. institution to ever boycott Elsevier over pricing and demonstrated that the academic community is fed up with the commercial publishers. The open access movement has advocated keeping the copyrights for published articles in their authors’ hands and making all articles publicly available online for free to give greater exposure to academic research. But that has meant that publishers’ operating costs would be borne by the authors – in other words, authors had to pay to publish. Problems began when this movement for justice was co-opted by unscrupulous operators who saw it as an ideal opportunity to make a buck, giving rise of the practice of getting scholars to pay to participate in conferences by promising them that their papers would be published in journals. In 2010, University of Colorado librarian Jeffrey Beall took issue with the corrupting influence money had on the publishing process, and he published a blacklist of unethical publishers as a warning to the academic community. Unfortunately, “Beall’s list let more people know about this money-making opportunity,” says NTU’s Lin. Beall’s List had 18 publishers in 2010 but had grown to 473 operators by the end of 2013. Beall shut down his site with the blacklist of predatory publishers and journals in 2017 after being repeatedly sued by blacklisted publishers. Research Methods: How were ‘Predatory Journal Articles’ Uncovered? 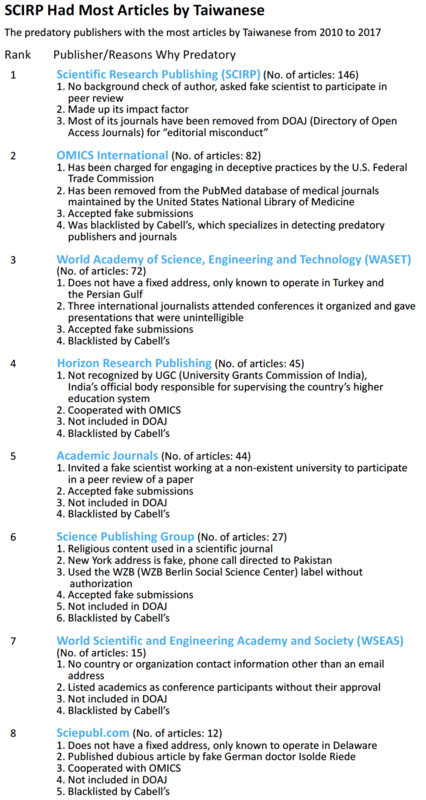 CommonWealth used a list of predatory journal publishers provided by Northern German Broadcasting and edu.tw to search 22 publishers and 26 web domains for traces of Taiwanese academics. To confirm that articles were in fact published in journals and not papers presented at conferences, CommonWealth only counted articles found through Google searches that were published in .pdf files from 2010 to 2017. One example: A Wuhan, China-based journal that often publishes works by Taiwanese goes by the English name of Scientific Research Publishing (SCIRP). We searched the keywords “edu.tw” and site:scirp.org file PDF. Then we took all of the .pdf files from the web, and confirmed them manually, only keeping journal articles and following up on each author’s Chinese name. Peter Hornung, who was in charge of the international collaboration, says that of the 22 publishers that have been investigated by partners in the project, seven accepted papers written by the media using SCIgen software that randomly generates fake papers. Although Scientific Research Publishing rejected one of those submissions, it did not check the author’s background, because it invited the scientist the journalist was pretending to be to participate in a peer review of another paper. Most of the other publishers have been named on blacklists compiled by the Indian government and journal analytics company Cabell’s. These publishers’ websites generally do not include addresses where submissions can be made or leave fake addresses in the United States or the United Kingdom. Others deliberately use names similar to the names of reputable journals. After searching and checking the 22 publishers, we found that Taiwanese academics had articles in journals of 13 of those companies. The most conservative estimate is that 469 academic articles from Taiwan from 114 schools, 15 hospitals and four organizations found their way into those suspect publications. How Did We Calculate the Number of ‘Predatory Conferences'? When academics involved were interviewed by CommonWealth, they stressed they simply attended the conference, and their presentations were turned into journal articles. To better understand how often Taiwanese academics attended questionable academic gatherings, CommonWealth used Python software to get information on the attendance at all conferences organized by OMICS in 2016 by scholars from different countries. Taiwanese attended such conferences 193 times, two times less than South Koreans. But South Korea’s academic community is much bigger than Taiwan’s, three times bigger, in fact, if looking at the annual number of Ph.D. graduates. In other words, the frequency with which Taiwanese academics attend predatory conferences is relatively high. In the second half of CommonWealth Magazine’s investigation on Taiwan’s mingling with predatory publishers, we take a look at how and why the phenomenon has taken hold.